During the closing days of 2017 publisher Elsevier is approaching as many as 400 Dutch researchers, who could have published Open Access in 2017 as part of a VSNU deal, but somehow….did not. At the same time, the university libraries, in close cooperation with Elsevier, conducted a survey among these very same researchers to find out what may the reason of their not making use of this opportunity. none of the respondents pointed to the absence of funder/university requirements. Many respondents added extra comments. Besides an additional remark related to the reason not having made use of the open access option, many explicitly stated the importance of open access and sometimes even expressed their gratitude for this reparation action. The first and most important conclusion of the survey can be that researchers who didn’t make use of the agreement are not at all negative about open access. Many give explicit support for open access in their comments. However, their unawareness about the agreement can be pinpointed clearly as the main factor why uptake is staying behind expectations. The list is regularly updated: please feel free to share this list with all your colleagues; the more people make use of these deals, the better! Open Access means shared responsibility for research programs. In the International Open Access week, 23-29 October 2017 we are posting interviews conducted with Leiden researchers. Today Huub de Groot, LIC. 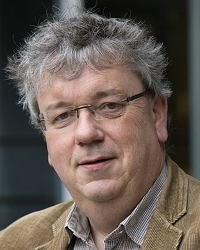 As professor at the Leiden Institute of Chemistry, Huub de Groot works with Magic Angle Spinning NMR at ultra high magnetic fields on ways to mimic nature’s ability to convert energy from sunlight: artificial photosynthesis. His research topic is one that attracts attention from experts and non-experts alike. He thinks policy makers should make their own judgement of facts versus opinions by open inquiry based on original research output, free from manipulation or coercion, to re-establish a profitable relationship between science and governance. Did the choice for Open Access indeed lead to more publicity? What about companies? Are they interested to read your research? So whom do you see as main beneficiaries within The Netherlands? What do you mean with cults? Isn’t science interdisciplinary? “For example physicists and chemists have both created a scientific practice of their own. While both are considered exact, physics is hypothesis driven with a predominant theoretical basis while chemistry is heuristic with a predominant empirical basis. The consequence is that they can make beginners mistakes in each other’s fields if they cross the borders. On the one hand, beginners mistakes are easy to correct by their very nature, while on the other hand they can be quite persistent with dogma’s taking precedence over evidence, when the teachings of adjacent disciplines are ignored or even disdained. How can Open Access solve this problem? “Currently we see all too often that funder’s policy is based on the whims of market and politics. For lack of knowledge charlatans shout things that would breach my scientific integrity if I said them aloud. But these ideas are funded, while good proposals are rejected. I have given lectures to the ministries about it and they say: we know this, but we simply do not have the materials and knowledge to correct it. Another point is that lack of access to older materials leads to forgotten science as well; it happens quite often that research done over half a century ago is repeated. What about the responsibility of the scientist? “Don’t forget: scientists are just humans. They create their own international world and if no one asks them to get in line with utilitarian scientific practice, they will have to adhere to high scientific standards of their own club. Many scientists lead a double life: on the one hand they have projects that bring in money, and once the funding is there, they use it to contribute to what is important for the development of their science field in a global perspective. This is then evaluated by non-experts: not on the scientific output, but on reports, impact and H-factors. Funding agencies already employ PhD’s from the right fields, why do they miss out? “The number of people that genuinely do want to understand what we are doing is steadily increasing. For instance, I am working with a social scientist who is helping us and sees that many engineers are messing things up. Biomass is a good example. 5 per cent of our gasoline has to be biobased by EG regulations. When the government wanted to increase this amount, many researchers saw easy money for their research. They made plans for pilot plants that could later ‘simply’ be made to work harder. But according to the first law of thermodynamics you can’t make energy out of nothing. In the end they had to think of all kinds of solutions behind the facade of the factory to increase production. For example they had to send trains to Russia to import wood for their factory. Currently we see a similar problem in our discipline where it concerns the second law of thermodynamics. You can only convert energy from one type to another, and while doing so, you will produce entropy so that the energy is less usable. If you convert sun light to fuel, you will have a thermodynamical loss and the amount of this loss is highly underestimated. Fundamental principles are ignored as researchers say: when we get the money, we will make the process better. Maybe you will get it right after trying everything else. But excessive trial-and-error, heuristics, makes research unnecessary expensive and could be prevented in favour of more rapidly converging analytical approaches. The public who has open access to the raw research output will be able to discern between these errors and real research. As a scientist, you should expose such anomalies, but this is where I draw the line. The people you criticize are also your colleagues, and just like everyone else I want to work in a pleasant atmosphere. What will Open Access change in chemistry? “If you thoroughly read the literature, you know a climate model such as the one from the IPCC suggests we can forecast and analyse the climate without a structured and general understanding from a scientific perspective. You will discover that extreme computing science models are being developed based upon amongst others a chemical mass balance for system earth. Something that is a hard sell now, but once the literature is open, policy makers can be held responsible to ensure that their policies are based on the best research output that science has to offer. What’s your opinion on the big deals made with publishers? What if you had to choose between high impact and Open Access? “High impact journals are increasingly under discussion. Hans Clevers said about publishing in these journals: 10 per cent of it is a result, the remaining 90 per cent is dreamt up. Not that it is wrong, but a small amount of real results is put into context and expanded. This is what people want, apparently. Do you think articles are too fragmented nowadays? “Nicolaas Bloembergen has just passed away. He is best known for his article on the theory of relaxation in NMR. He used to publish around 1 article per year instead of 25 articles per year as many people do nowadays. But this one article had more impact than 25 articles from current scientists. I think we should return partially to this method and take time to think before we publish. Escape conference hypes and think deeply. In the end you will get the credits. 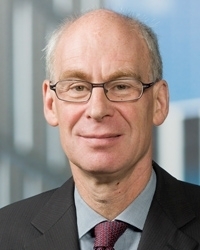 As director of the Leiden Institute of Physics, Eric Eliel has not been active as a publishing scientist for approximately 6,5 years. However, the Open Access output of ‘his’ physicists is something he values greatly. Doesn’t the library provide you with access to these publications? Do you think a lot of people are willing to read research articles? 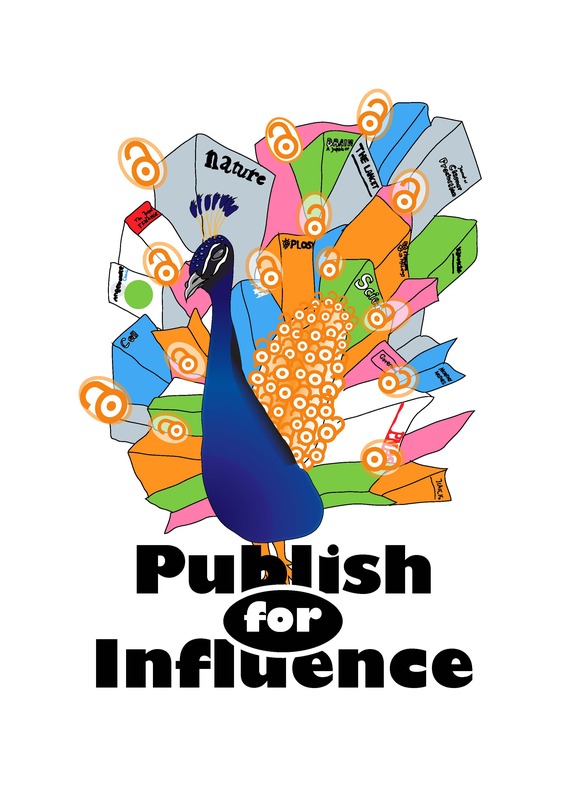 Do you actively tell the people of your institute to publish Open Access? Arxiv already exists since 1991 and your first Arxiv publication dates back to 2003. What has Arxiv brought to the physics community over time? “Arxiv is immensely valuable to physics. As a manager, I also like to look up what someone has done over the last few years in Arxiv. If they are diligent about Arxiv it is the best overview, even better than the Web of Science. You will find more results as some things are not published in a traditional way. For example if you work in a major consortium on an enormous project, such as the LIGO gravitational-wave inferometer or the KM3NeT neutrino observatory, there are many progress reports that really reflect personal output which are not published. They appear on Inspire and Arxiv. The traditional publications only start when the big bang comes, the gravitational waves are observed. In Web of Science you will see that the citation scores for these researchers suddenly jump from near zero to infinity because they were one of the thousand researchers on this seminal article. This makes their contribution very difficult to assess. Is there a difference in disciplines when it comes to Arxiv-uptake? Do we still need traditional journals? “If you give me the permission to dream: commercial publishers do not appear in my dream. They run and own the journals that create the most visibility. As a researcher you occasionally have to – because of funding – and want to score in the Nature family or Science. But these publishers want to make money; they have to. They can’t do this on advertisements only; running a journal with all the editorial and business sides is an expensive process, especially if you reformat the paper like Nature does. Can we create a similar high impact experience in Open Access? “I do believe that things will change. This afternoon, for example, I have to go to a PhD defense. In the thesis I saw all these QR-codes in the margin. I did not know what they were for, but after checking my iPhone, I found out they referred to Youtube movies. As an examiner I may question if these were part of the thesis or not, but I like these new possibilities opening up in publishing. 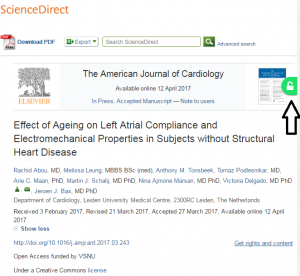 Online publication and Open Access make it possible. The new generation operates in completely different ways. Every year I see in theses that they spend more time on new methods to present their work. Science becomes more alive: you do not see a simple plot with five spheres, but get a movie that shows how the different spheres evolve. However, we have to think about integration. How can we keep the material usable? Open Access helps. The seminar is free of charge. Please register by filling out this form. The seminar will focus on different aspects of publishing, visibility and influence– be it academic, societal, or economic. It will highlight the importance of being open and discuss complementary indicators and methods for measuring influence. The seminar will take place in the context of international Open Access week 2017. 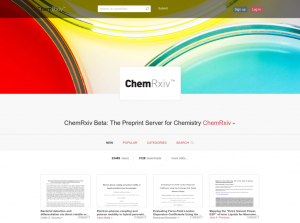 On August 14, the American Chemical Society, Royal Society of Chemistry and the Deutsche Gesellschaft für Chemie launched a beta version of their preprint server ChemRxiv. The project, already announced in 2016, was put out shortly after the announcement of a section for chemistry on Elsevier’s SSRN preprint server ChemRN a week earlier. With ChemRxiv chemists may dissemeninate their findings much faster, which becomes a necessity in times where publishing might take up to 2 years because of overworked peer reviewers and the so-called publication cascade. This means a PhD can show his promise before he is searching for a postdoc position. It also helps in furthering science, as the results may be discussed early on and others can build upon the work. Top journals such as Science even prefer the articles with preprint as they might have already gained some traction before publishing. And, last but not least, the work is already protected as a finding, so no other research group might steal the spotlight by scooping it. The publication process itself is fairly simple. The article has to be submitted before it is accepted at a journal. Within 1 or 2 days after posting, the preprint will get its own doi after it has gone through a quick test for plagiarism, bogus and offensive content, probably carried out by PhD-students. It is explicitly not a peer review, just a test. Afterwards the preprint cannot be removed, but it may be updated with later versions. Chemists are known to be a skeptic lot, this is probably why it has taken so long before a preprint server for chemistry was established. Currently the main preprint servers, Arxiv and BioRxiv, only accept articles in specific disicplines: physics, mathematics, computer sciences and life sciences. However, the three chemical societies expect the demand for their preprint server to be high. After the first announcement last year, a fake version of ChemRxiv immediately popped up and chemists were eager to add to it: within a week several articles had been uploaded. For the real beta version we see a similar story: within a month after launch, 45 articles have been posted, attracting over 3,000 downloaders and 22,000 viewers (as seen on September 14). The oldest preprint server, Arxiv.org, started out exactly 26 years earlier on August 14, 1991. It is a well established source for physics information, even though not every physics discipline attributes equally. Authors from theoretical fields use it more often than those from experimental fields. Its postings seem to be quite successful at getting published as well: a 2014 paper states roughly 64 per cent of the content was published in a Web of Science indexed journal. (Larivière et al., 2014) Other articles are probably still in the submission process. 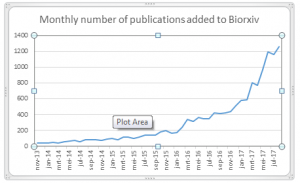 Biorxiv, the biology and life sciences preprint server, took some time to gain popularity. In biology, just as in chemistry, there was a fear of letting ou t articles before peer review. However, a growing number of biologists now find their current work posted on Biorxiv to be a great topic starter at conferences and see it as addition to their Curriculum Vitae as nowadays the time to publish your first author paper might be longer than the time needed to graduate. 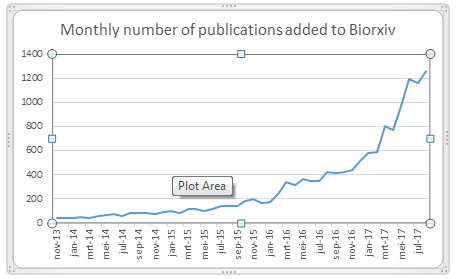 (Vale, 2015)(Bhalla, 2016) The number of submissions has grown exponentially since Biorxiv launched. Even though the societies are very positive about the future of their preprint server, one hurdle still remains: not all journals accept publications that have been dissemeninated as preprint. One of the highest impact examples is Angewandte Chemie. But not even all journals of one of the founders, the American Chemical Society, allow the preprint to be posted before publication. For example, the Journal of the American Chemical Society (JACS), The Journal of Natural Products, The Journal of Organic Chemistry and Macromolecules all state ‘new’ information already published elsewhere is not eligible to be published in the journal. To facilitate the process ACS has published a list with policies online. Policies from other publishers can be found here. The ACS itself expects the problem to die out slowly. Policies of individual journals are made by the editors and changes in the boards will probably be reflected in the policy. Though there may be some acceptions as they told last year while visiting the Netherlands for an Open Access meeting: journals with quick turnarounds, so called communications, do not benefit from preprints and would see their market destroyed if they would allow them. Perhaps, these journals might really be replaced by overlays on top of the preprint server as we see evolving in physics at the moment. 2018 will sadly see the end of a very successful financing instrument: NWO’s Incentive Fund for Open Access publications started in 2010 and has enabled many scientific authors to venture outside of their comfort zone and opt for a more reader friendly type of publishing at a time when a culture change in traditional publishing was not yet foreseen. The latest changes in Dutch academic publishing with great emphasis on deals between universities and traditional publishers, have brought many fantastic deals, which deservedly caught extensive attention. Why then, would NWO policy makers have thought, should we continue the Incentive Fund? Well, because…. 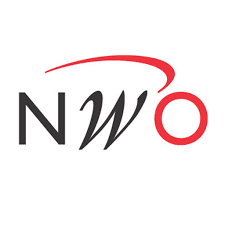 Put your money where your mouth is: if NWO requires Open Access publishing from it’s grantees, it should also provide the instruments needed.